A few years ago, advertising executive Frankie Layton heard a worrying statistic. In 1900, the plastic to plankton ratio in the ocean was 0:1. In 2000, that ratio had climbed to 6:1. And by 2010, seven years ago, the plastic to plankton ratio was officially 60:1. Frankie wanted to do something, to start something, it took a couple of years for the idea to take a proper shape. 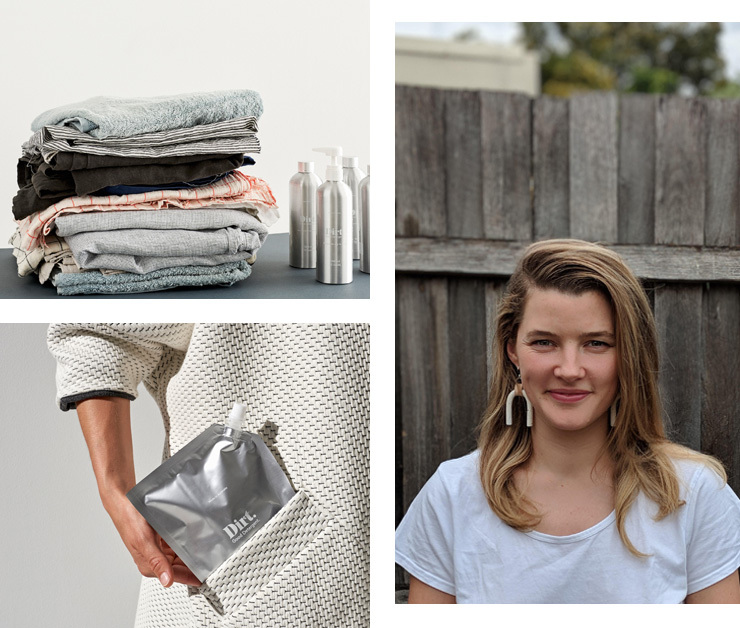 The result was Dirt—an environmental grassroots company that makes sustainable and ethical clothes detergent. Dirt runs along the same lines as Who Gives A Crap, the wildly successful toilet paper social enterprise. Take a product that people don’t really care or think about, and give them an environmentally sustainable alternative. Bam—all you have to do is switch up your purchasing habits. Here’s how Dirt works. Most laundry powders you grab at Coles are filled with stuff called micro-plastics. These things get washed down the drain and into the ocean, where they never break down. A lot of marine animals confuse them with food, and they work their way into the food chain (sometimes, back up to the flake on your plate). Dirt takes a different tack. Frankie worked with scientists and chemical experts to design a laundry liquid that kicks the sh*t out of stains, but doesn’t clog up the ocean. The formula is plant-based, and packaged in aluminium, which means 90% less plastic, compared to the major brands. Bonus points: 50% of Dirt’s profits go straight back into the oceans, via the famous Ocean Cleanup project, which is due to kick off in the next couple of years. In 2017, living green is all about small incremental changes. Swapping regular TP for the recycled stuff. Switching to veggo a couple of days a week. Cycling to work, instead of fighting traffic on the freeway. Little choices, but they add up to a big difference. If you want to learn more about Dirt, check out their uber-stylish website here.